Councilmember Mike O’Brien (District 6, Northwest Seattle), Chair of the Council’s Sustainability and Transportation Committee, introduced Resolution #31826, which memorializes the Seattle Center City Bike Network and establishes an 18-month implementation schedule for creating a connected, protected bicycle lane network in downtown Seattle by 2020. 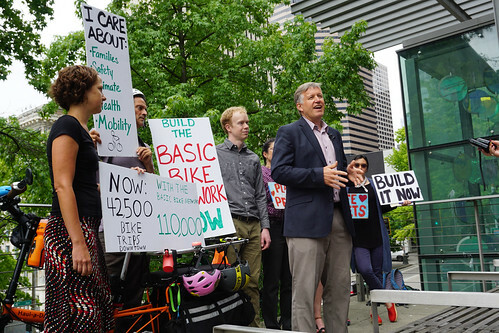 The resolution was introduced to the Committee during a special hearing on Wednesday, July 18 at 12:00 p.m.
“With Wednesday’s committee meeting, we’re reaffirming our commitment to establishing a connected, protected bicycle lane network in downtown Seattle,” said O’Brien. “We’re also committing Seattle to achieving zero traffic fatalities and serious injuries by 2030. Given what’s at stake, it’s too expensive not to make more investments in completing the bike network for all to utilize and enjoy,” added O’Brien. O’Brien was joined by advocates and riders alike who spoke to the efficiencies of bike lanes, and the cost-effectiveness of a network, which may help to mitigate the ‘period of maximum constraint’ anticipated in 2019. “Today’s vote marks an important step forward for the thousands of people who already bike in downtown Seattle every day. A network is only as strong as its weakest link: This resolution sets a concrete timeline for an end-to-end route through downtown, making critical connections between the 2nd Avenue spine and bike lanes in surrounding neighborhoods. Together these routes will create a Basic Bike Network that will makes biking a more safe and convenient option for even more people who live and work in Seattle,” said Vicky Clarke, Seattle Policy Manager, Cascade Bicycle Club.